Do you remember Mrs. Tea? Launched in 1995, the Mrs. 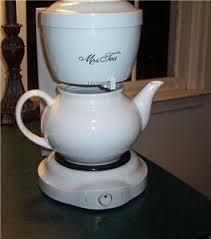 Tea machine was Mr. Coffee’s vaguely British counterpart, an automatic counter-top brewing machine for loose-leaf tea. The device allowed for extra steeping time, and best of all, brewed into a classy-looking plain two cup ceramic teapot. Mrs. Tea isn’t available to the tea snobs of today, though: she disappeared from the market sometime between 1998 and 1999. Amazon.com still has a new one for sale for $247.99 and they Ebay has used ones for between $20 and $49 plus shipping. The Handicap Foundation has a like new one for sale for a mere $25 and no shipping.